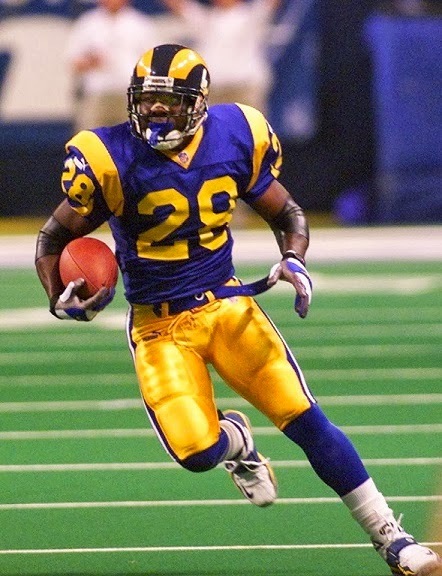 Taken in the first round of the 1994 NFL draft (second overall) by the Indianapolis Colts, Faulk had a Rookie of the Year season with 1282 rushing yards and 52 catches for 522 more, establishing himself as an outstanding combination runner/receiver. He was selected to the Pro Bowl as well and was chosen again following a 1995 performance in which he rushed for 1078 yards and had 56 catches. Injuries, and a subpar offensive line, reduced his production significantly in 1996 and he ran for 1054 yards and caught 47 passes for a 3-13 team in ’97. Faulk returned to Pro Bowl form in 1998 as he rushed for 1319 yards and gained 908 yards on 86 pass receptions to lead the NFL with 2227 yards from scrimmage. He was traded to the Rams in the offseason for two draft picks. Rams went 13-3 to finish first in NFC West with conference’s best record while leading NFL in total yards (6412), passing yards (4353), scoring (526 points), and touchdowns (66). Won NFC Divisional playoff over Minnesota Vikings (49-37), NFC Championship over Tampa Bay Buccaneers (11-6), and Super Bowl over Tennessee Titans (23-16). Faulk followed up with another strong season in 2000, receiving MVP consideration while setting a new record for touchdowns (26) and gaining 1359 rushing yards plus 830 more on 81 catches for a total of 2189 yards from scrimmage. In 2001 he received MVP recognition for the third straight year as he gained 2147 yards overall, with 1382 rushing and 765 on 83 catches. He scored 21 touchdowns to lead the NFL in scoring for a second consecutive season with 128 points. Faulk was a consensus first-team All-Pro for a third straight year and was selected to the Pro Bowl for the fourth consecutive time. He had one last Pro Bowl season in 2002 (his 7th overall), but injuries and accumulated wear-and-tear were reducing his production. While he played until 2005, he never again gained over a thousand yards rushing or two thousand yards from scrimmage. For his career, he rushed for 12,279 yards and 100 touchdowns and caught 767 passes for 6875 yards and another 36 TDs. At the time, his 19,190 total yards ranked sixth all-time and 136 TDs placed fourth. Faulk was inducted into the Pro Football Hall of Fame, Class of 2011. MVP Profiles feature players who were named MVP or Player of the Year in the NFL, AAFC (1946-49), AFL (1960-69), WFL (1974), or USFL (1983-85) by a recognized organization (Associated Press, Pro Football Writers Association, Newspaper Enterprise Association, United Press International, The Sporting News, Maxwell Club – Bert Bell Award, or the league itself).